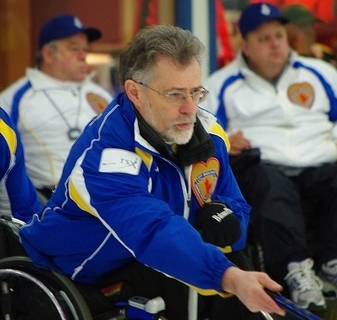 Calgary's wheelchair curlers lost their Ogden CC home when the curling club disbanded over the summer, and have struggled to find viable alternatives to their old fully accessible venue. They have been playing in an able-bodied league at the Calgary CC, and that club have been very supportive, going so far as to purchase an expensive (and heavy) ramp to allow side door ice access. Getting suitable practice time at what may be Canada's busiest club, however, has proven impossible. The Garrison CC has provided practice ice late Sunday afternoon; an awkward time that has meant a drop off of attendance especially among the recreational players. The team itself. together for over seven years, is adjusting to the absence of a founding member. Bridget Wilson. 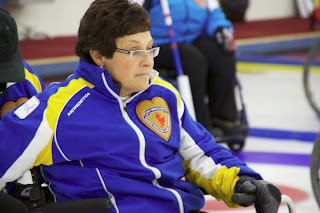 Bridget got wheelchair curling started in Alberta but always found traveling a strain. She spends most of the winter in Arizona and decided to step back for a year at the conclusion of last season; spending more time with her family and not concerning herself with being match ready come the 2012 Nationals. Bridget remains part of the team and is playing in a fun league while in Phoenix, though Martin Purvis will play front end at this season's competitions. Martin joined the team in 2009, winning silver at the 2009 and 2011 Nationals while playing 2nd, and also made the All-Star roster in 2010. There is a possibility that Calgary will be challenged for the southern Alberta slot at Provincials by a team from Lethbridge, who recently brought six players to Calgary for an afternoon pof curling. Medicine Hat is also rumoured to be preparing a team.